The fights are really good here, the best being the restaurant fight that started as free for all brawl but then features a fantastic fight between Jackie Chan, Wang Lung Wei, and Wai Man Chan. The chase scene with Dragon Ma and Chun and the pirates was also a well done mix of comedy, stunts, and fight choreography, as is the finale. What has to be understood here is that this film was made in 1987, and for those of you who follow my reviews, know that the make-up of Jackie Chan’s films changed in the 90’s, where the stunt work started to outweigh the straight up kung-fu fight scenes, and the stuntmen were spared the more jacked-up stunt work (Nasty falls aside). That doesn’t mean the film isn’t fun, because it is, but for those who are into the more fight-heavy Jackie Chan films may be disappointed. 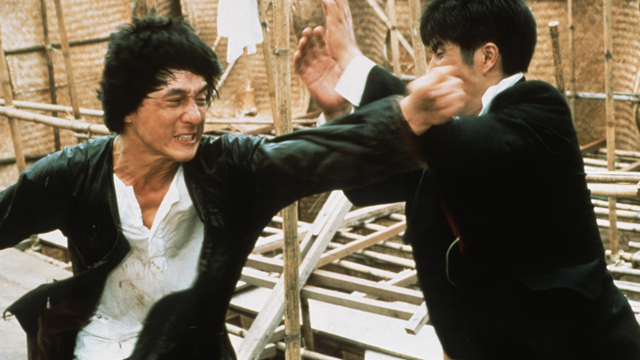 A Jackie Chan joint that features fantastic stunt work and creative fight scenes, and is a precursor to Jackie’s 90’s output. A fun sequel all around. I just watched this recently (going through all of Chan’s work in chronological order, starting from Cub Tiger from Kwangtung). I seem to be in a minority on this, but I’m just not a fan of the first Project A. However much I love to see the trinity together in any movie, the first Project A has precious little quality action (the opening bar fight and country club fight being the exceptions, but both far too brief) and possibly THE most lackluster finale of any Jackie Chan straight-up action film. The story and comedy of Project A was also painful and rarely enjoyable. Biao and Sammo were mostly wasted, however large their roles, especially compared to Wheels and Dragons Forever. Project A 2 on the other hand I recalled having liked the first time around and I loved it on this latest viewing. The action was much more inventive and, frankly, story driven. The scene inside Maggie Chung’s apartment where the characters keep arriving and having to hide from one another, until there are EIGHT people all trying to to be seen by any of the others and many of them not knows half the others are even there and all in this teeny tiny Hong Kong apartment and the scene being so ridiculously long and drawn out and going through a half dozen complete permutations and ending in a mini-fight – the slapstick “Noises Off” style choreography is some of the best ever put to camera. It’s authentically hilarious and entertaining. I’m stunned more people don’t mention this epic sequence.